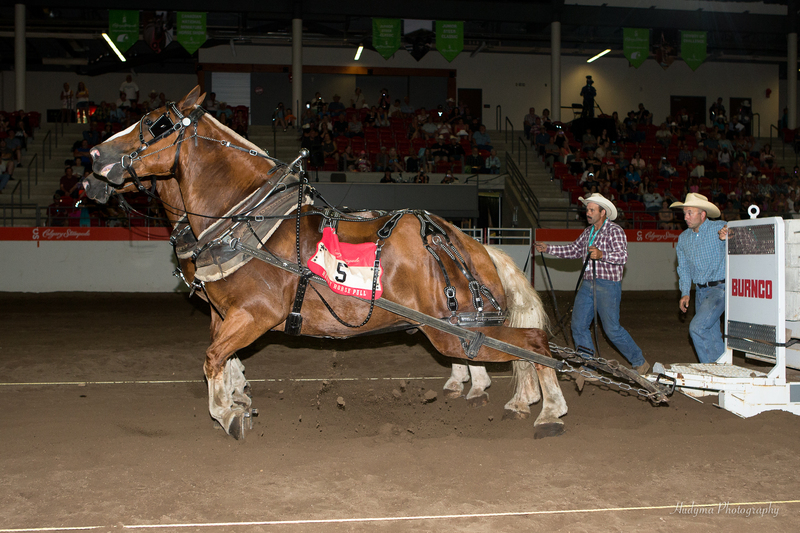 CALGARY — The Calgary Stampede Heavy Horse Pull is a show so nice, Melvin Yoder had to enter it twice. And the strategy paid off for the teamster from Mondovi, Wisconsin, as one of his two teams in the Heavy Weight division topped the leaderboard on Sunday night with a full pull of 14 feet at 12,500 pounds. The American pulls he enters generally call for a 27.5-ft. pull without stopping, Yoder said. South of the border, teamsters also have three tries to get the load across the line and they can bump it, he said. Yoder, who was assisted by his 19-year-old daughter Chayenne, had a second team in the final round at the Nutrien Western Event Centre. He teamstered the pair of Bob and Dennis to the 11,500-lb. round, but had to withdraw when Dennis threw a shoe. Yoder took the Champion title in the same division last year with the team of Duke and Bob. He split them up this year, doubling his chances at his second Stampede. “There was a lot of weight difference and size. That usually doesn’t work very long, so I bought new horses that were better matches,” he said. Chayenne has been teamstering for three years now, and her father would like it if she took the reins of a team at Stampede one day. “I’d like that, too, but it takes a lot of time and dedication,” she said. 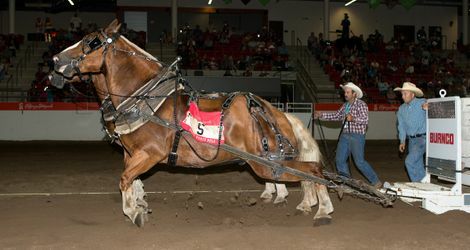 Over three nights at the Stampede, teams in three weight classes pull weighted sleds — up to more than five times the horse’s body weight — a distance of up to 14 ft. The Champion in each class received $3,500; the Reserve Champion $3,000, with a sliding scale of payouts for the rest of the field. The Champion in each weight division also received a trophy slunk, a championship bell and a pair of trophy halters. Additionally, their names were engraved on perpetual trophies that will returned for next year’s Stampede. In the Light Weight division, held Friday, Travis House drove his own team into the Champion spot with nine full pulls, topping out at 10,000 lb. House, of Wheatland, N.D., placed fourth in the same division at last year’s Stampede. Reserve Champion went to Paul Geray, also teamstering his own horses, for a 43-inch pull at the same weight. Veteran competitor Randy Dodge topped the field in Saturday’s Middle Weight division at 10,500 lb. in the ninth round. The teamster from Albany, Oregon co-owns the team of Simon and Tommy Boy with Airdrie’s Stan Grad. House extended his winning streak by landing the Reserve Champion spot with a 107-in. pull. And Dodge took the Reserve Champion spot in Sunday’s Heavy Weight division with another team he owns with Grad. Warren and Tom posted a 107.5-inch pull at 12,500 lb. Visit ag.calgarystampede.com/results for full results from the Heavy Horse Show.